How will the new trilogy that kicks off with Star Wars: The Force Awakens end? The creative team behind this latest chapter in the long-standing franchise don't yet have an answer. Though, they do have a few ideas. The climatic third act of Star Wars: Episode IX hasn't been written. And probably won't be for a while. Everyone already knew how Star Wars: Episode III - Revenge of the Sith would end, as the epic battle between Anakin Skywalker and Obi-Wan Kenobi was often debated and fantized about ever since the original trilogy was first introduced. But things aren't so clear when it comes to the path laid out in front of Force Sensitve Rey and her new friends Finn and Poe. While The Force Awakens only opened seven days ago, perhaps it is a little premature to begin talking about Star Wars: Episode IX. But it makes sense that the team behind these movies would have some kind of game plan laid out on the table, however skeletal it may be at this point. After all, George Lucas had Chapters 1-9 planned out, but Disney did away with most of those ideas after they bought LucasFilm. The Star Wars: Episode VIII script is already completed, and from what we've been hearing, Rian Johnson has created something that makes even J.J. Abrams jealous. Star Wars: The Force Awakens co-writers J.J. Abrams and Lawrence Kasdan didn't have a hand in this latest screenplay, and it sounds like Colin Trevorrow is only getting minimal help from the pair as he sets out to create the final chapter in this new trilogy. When the LA Times talked to Lawrence Kasdan this past October, he had this to say when asked if he was contributing much to the story as it propels itself forward. "Not really. ['The Force Awakens'] sets up a lot of stuff. There's a lot of people to deal with. And Rian took on that job and he's going to change it, because he's Rian. And I'm sure Colin will change what Rian does...These movies will all be so different. Rian Johnson is a friend of mine - he's going to make some weird thing. If you've seen Rian's work, you know it's not going be like anything that's ever been in 'Star Wars.'" While the three films are said to be strikingly different, it seems like it would make more sense if everyone knew where these characters were headed. But that doesn't seem to be a concern. Lawrence Kasdan went onto further explain the following. "We talked about [the ending] - and there's a certain thing that people who are involved with it feel should happen. There's a kind of movement that happens. But it's not in your control. It's going to veer off with Rian, and it's going to veer off another way with Colin." It sounds like Star Wars: The Force Awakens kicks off a basic story arc, but it's clear that the next two directors are being given quite a lot of freedom in how they deal with its outcome. At this point, nothing is set in stone. And the fates of Rey, Finn and Kylo Ren could end up being anything. There are certainly a lot of fan theories on how all this will play out. And the artists behind actually making these things become a reality are probably paying attention and deviating from all of those theories as much as they can. 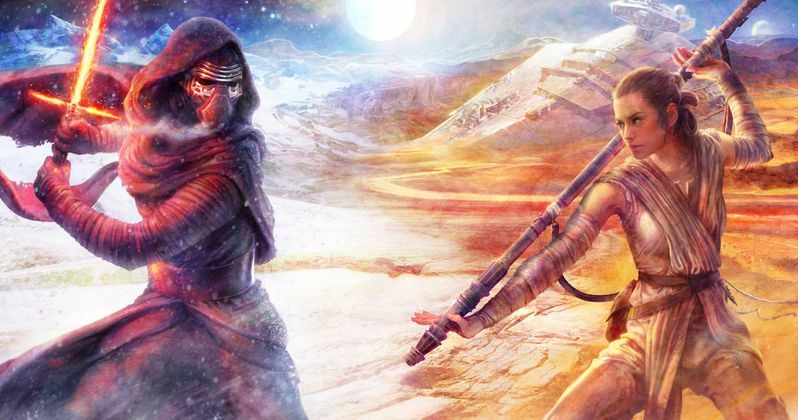 As Star Wars: The Force Awakens stands, it sure has us asking a lot of questions. Will they be answered? Who knows? But if they are, they won't be answered by the two people who set these mysteries in motion. Which has us asking, should we really believe in this? Because it sounds like their making it all up as they go along.